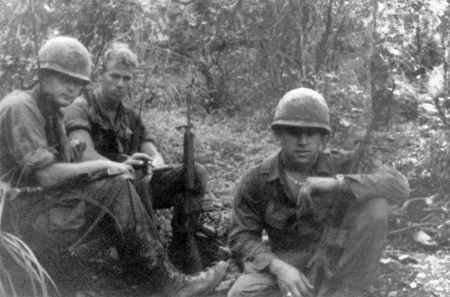 Every light weapons infantryman in Vietnam experienced a wide range of incidents that were very dangerous and life threatening, but not significant enough to be considered a firefight. Some of the incidents left a vivid memory in the mind of the soldiers, while others are just a vague recollection with no memory of the details of what really happened. I had several such incidents, and I want to relate three of them now. During the month of July 1967, our platoon was involved in cordon and search missions on a regular basis. We would go out on search and destroy missions during the day and set up for the evening before dusk. Then, during the early hours of the morning, possibly 2:00 or 3:00 a.m., we would saddled up and move out in single file to the village we would surround, and then wait for the Vietnamese National Police to come and search the village for VC, as well as supplies for the enemy. On one such mission, we saddled up and headed out in a single file to the village we were to surround that morning. All of a sudden, the column stopped and we just sat down for several minutes. I later found out that the latter part of the platoon, which I was in, got separated from the rest of the platoon, and they had to double back and locate us so we could continue to the village. We arrived at the village, and each member of the platoon was assigned a place to stand guard in a dry rice patty until day break when the National Police would arrive. As we were being assigned to our two man positions, I noticed that we had a lot more space between the positions on both sides of us than in previous missions. Shortly after I expressed my concern, I saw a man, almost certainly a VC or NVA soldier, run through the space between my position and the one to the left. I was thinking that one got away, but it didn’t seem to be a major issue. However, a short time later I heard gun shots and some bullets were hitting very close to me. I thought that the person who escaped saw where I was at and singled me out for his target. After a second burst, I moved to my right to seek some cover, and to get out of his sight. However, I was still in his sight because he fired a couple more rounds at me that I could hear go past my head. I moved again, but he continued firing at me, so I decided to just lay still and hope he would stop firing. I don’t know if he couldn’t see me anymore, or if he thought that he had killed me, but the firing stopped. However, to be safe, I stayed in my position long enough to be certain that the VC had left the area and wasn’t going to shoot at me anymore. The rest of the morning was quiet and without incident. My platoon had been pulling a lot of search and destroy and cordon and search missions, and we were getting very little rest. As a result, everyone in the platoon, including myself, were very tired because we were getting no more than four hours of highly interrupted sleep each night. But somehow, we had to find the energy to keep going so we could complete the missions assigned to us. After completing one of our search and destroy missions, the platoon set up for the evening. We set up our perimeter, dug our trench to provide a small amount of safety, and set out our trip flares, hand grenades and claymore mines. Then, after it was dark and we started pulling our guard duty, we were told to saddle up because we had set up in the wrong location. So, we had to retrieve our trip flares, hand grenades and claymore mines and travel in the dark to the correct location. Upon arrival at the correct location, we had to again dig our trench and set up the flares, grenades and claymores. The place I was assigned was at the top of a small incline, maybe three to four feet high straight up. The ground was flat and partially sandy, so digging the trench was easy. I wasn’t happy with this location because a group of trees was about thirty meters straight forward of my location, and I had no cover at all while I was pulling my guard shift because the ground all around me was very flat. When it was my turn to pull guard, I sat on the ground and had my legs hanging down the incline. That was the only position I thought that would keep me awake. I tried squatting, but that hurt, and I couldn’t stay in that position very long. I considered getting in the prone position but discarded the idea because I was really afraid that I would fall asleep. So, I just sat down on the ground and let my feet hang down the incline and hoped we would have no incidents while I was pulling guard. All of a sudden I was startled because I was sitting on top of the incline with my cigarette lighter fully lit. I instantly figured out that I had fallen asleep and, for some unknown reason, lit my cigarette lighter. Then, I immediately put out my lighter and fell flat on my back. Just as my back hit the ground, a burst of gunfire came from the group of trees directly in front of my position. The burst of five or six rounds went directly over and very close to my head. I then crawled on my back to try to find some cover. Another burst was fired that went directly over my head again. I crawled on my back until I reached a small trench that gave me some cover from the gun shots. One more burst of about five or six rounds was fired that went directly over my head again. I just laid in the trench for several minutes until I thought it was safe to raise my head again. The enemy had a direct bead on me because I had given him a clear target when I lit my cigarette lighter in my sleep, but I didn’t want to become a notch on his AK-47. Fortunately, the rest of the evening passed with no other incident. 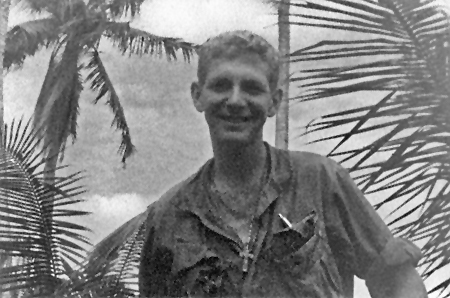 Lieutenant John Pape was my platoon leader when I was first assigned to the platoon, but his tour had ended and he was sent back to An Khê to be shipped back to The World. A new lieutenant, a total cherry with no experience in Vietnam at all, was assigned as our new platoon leader. I’ll never forget his first day with the platoon. We had been told that we were going to LZ English for our monthly shower, and so we could spend a little time at the PX, or anything else we wanted to do with about four hours of free time. However, the new lieutenant wanted to check us out and see if we knew what we were doing! So, we went on a mission, and I got to walk point, something I absolutely hated to do. After the mission was completed, the new platoon leader seemed to think that we actually did know what we were doing. About one week later, we were on a search and destroy mission and we came up to a village. The platoon leader instructed us to stop as we came out of the foliage and was on the edge of the dry rice patty. Then, he ordered us to line up abreast so we could walk about one quarter of a click through the dry rice patty and assault the village. Sergeant Larry Douglas was my squad leader at the time, and he assigned me the location from which I would walk to the village. We were not grouped together, there were about five or so meters between me and the guy on either side of me. As we started moving toward the village I discovered that the area I was to walk through was the space used as a toilet for the village! After taking about three or four steps, I could smell and see the feces that were scattered all around the space in front and to each side of me. Oh man, was I upset! I took my M-16 from the safe position and put it on full automatic fire. I was extremely upset and angry and, if someone fired shots from the village that forced me to fall and lay down in the feces and urine, somebody was going to pay dearly. Then, we received orders to stop and fall back, we weren’t going to enter the village abreast after all. Sometime later I found out why the assault abreast of the village was halted. Apparently, Richard Waller, the RTO, got on the radio with Sergeant Prock, the platoon sergeant, and told him what was happening. Sergeant Prock yelled to Waller for us not to move, for us not to take another step until he got there. 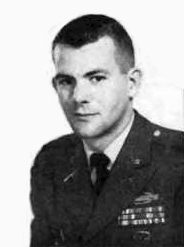 The cherry lieutenant made a few more tactical blunders, and was relieved of command in less than four weeks after he took over the platoon, and he was replaced by Lieutenant Jerome Church. An Khê — maps: An Khê and Vicinity, An Khê (Camp Radcliff), Detailed. 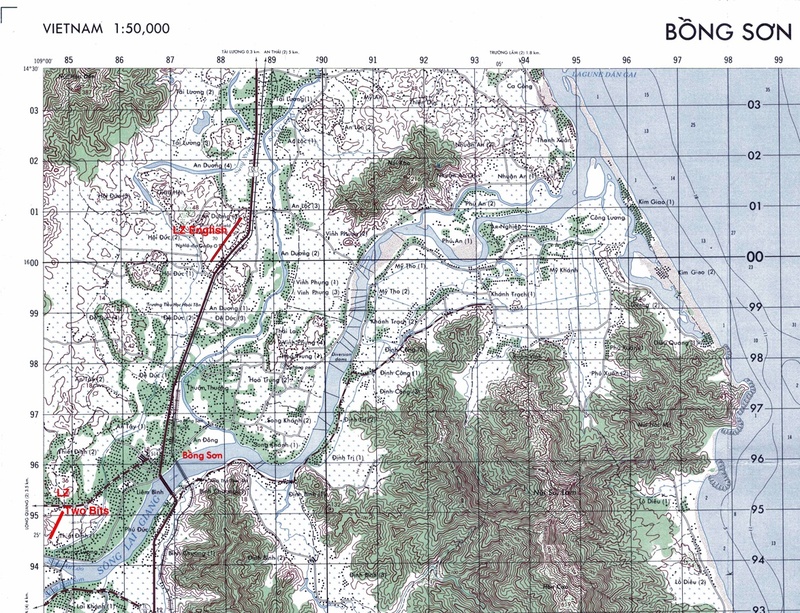 LZ English — found on the following maps: Bồng Sơn, LZ English, LZ Two Bits; Bồng Sơn, the An Lão Valley, and Tam Quan.